Berlin: Angela Merkel won her toughest challenge yet as German Chancellor by pushing through changes to a rescue fund for the euro zone debt crisis on Thursday without the humiliation of relying on opposition support. Germany’s approval of the beefed-up bailout fund with much stronger support than expected in the Bundestag (lower house of parliament) provoked a sigh of relief in markets worried about Berlin’s commitment to resolving the debt crisis. Support from the opposition meant there had been no doubt that Germany would okay new powers for the European Financial Stability Facility (EFSF), which some countries like Finland have ratified but others, including Slovakia, are dragging their feet on. After some intensive arm-twisting among the ranks of Merkel’s centre-right coalition, 315 coalition lawmakers voted in favour -- just over the 311 Merkel needed to show she can pass crucial euro zone policy without opposition help. “For Merkel this is without doubt a great success and it will be a great relief for her party," political scientist and Merkel biographer Gerd Langguth said. Relying on the pro-euro Social Democrats (SPD) and Greens would have seriously undermined Merkel’s authority and ability to pilot fresh measures to combat the euro crisis. In total 523 lawmakers voted for the bill, 85 against and there were only three abstentions. 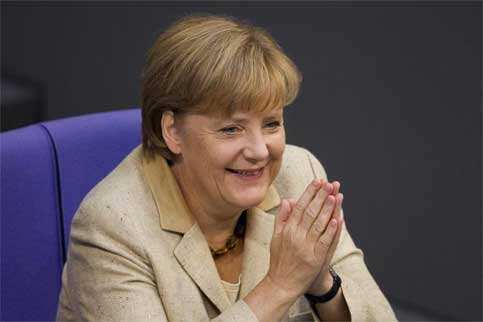 “This is a great success for Merkel and will strengthen her position," said Berenberg bank economist Holger Schmieding. Merkel was successful in persuading MPs that taxpayers’ money would not be wasted by supporting bailout measures -- but she could not rule out that the money might be written off if, as financial markets increasingly fear, Greece defaults. Germany will shoulder up to €211 billion of the fund’s €440 billion worth of guarantees, but the critics in the Bundestag fear it is already clear this will not be enough and taxpayers will be asked for more. That impression was reinforced by talk at the International Monetary Fund (IMF) last weekend of the need to beef up the EFSF even more -- on top of the extra powers decided by European leaders in July -- by leveraging its capital and bring forward the permanent scheme supposed to replace it in mid-2013. Finance minister Wolfgang Schaeuble told the Bundestag in a fiery debate before the vote it was “indecent" to speculate at this point about Germany being asked to contribute more to the EFSF. “We’re borrowing money from our children ... and it is money that we don’t have," said one rebel in Merkel’s Christian Democratic Union (CDU), Klaus-Peter Willsch. Merkel has often been accused in Europe and at home of dithering on the euro crisis, but Thursday’s outcome may improve the view of her crisis management and even improve her hopes of taking the conservative bloc she has led for 11 years into the next elections in 2013. “This could be a turning point for the chancellor in regaining citizens’ trust," said Langguth. But she still faces two more votes in coming months related to the euro crisis -- on the second Greek bailout and on a permanent mechanism to succeed the EFSF. International auditors return to Athens on Thursday to deliver their verdict on whether Greece’s tougher austerity measures qualify for further aid. The chancellor has told Greece she wants to wait for the results of an audit by the “troika" of the European Union, European Central Bank and IMF to see whether its findings “tell us we will have to renegotiate or not". Such talk by Merkel and other German officials may refer to raising the level of private creditor involvement in the Greek bailout, by getting them to accept bigger potential losses -- or “haircuts" -- on their Greek sovereign bond investments. Senior coalition figures like economy minister Philipp Roesler, head of Merkel’s Free Democrat (FDP) partners, have already said an “orderly" Greek default should not be taboo.